Alcohol is a fun ny thing. It makes you do things that at any other time you would think to be somewhat foolish or unwise. 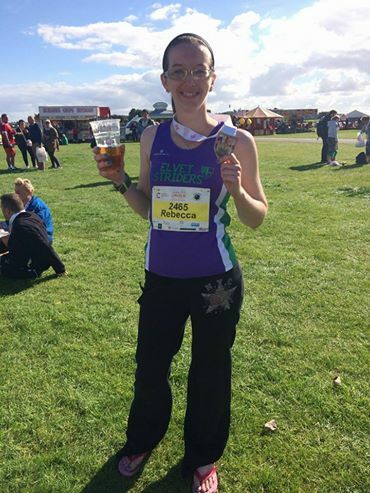 And that is how I found myself on the start line of Lincoln Half Marathon; a decision made during a girls weekend under the influence of cocktails that tasted like chocolate milkshake. Having only completed my first half marathon 3 weeks previously, and carrying more injuries than the England football team, even to me this seemed like it could be an error of judgement. However, there was a greater purpose to this run than just getting myself over the finish line. 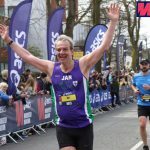 In my year and a bit of running with Striders, I have been overwhelmed by how supportive both club mates and the wider running community have been. There are people without whom I would have failed to finish events, or not even signed up at all. 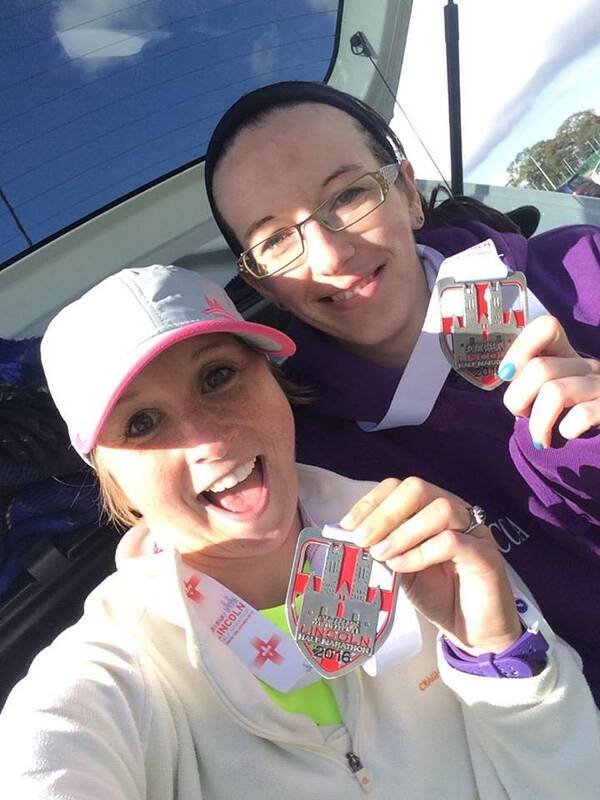 So this race was payback time – it was my turn to help my friend Sara (Witham Runners) finish her first half marathon. So bright and early we arrived at Lincolnshire Showground to be met by an event village with everything you could want – including a local running shop for any last minute emergency kit, a plethora of catering outlets, and impressively a posh coffee vendor! Supping our lattes and taking in the atmosphere, we realised that this event was going to be bigger than we anticipated. It was the first half marathon held in Lincoln for 25 years and given the amount of participants, spot on organisation and massive public support en route, I suspect it may not be the last. 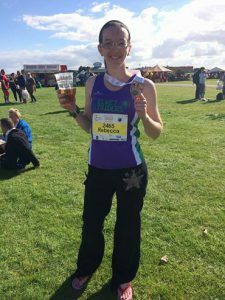 As the waves of runners were called to the start line, we positioned ourselves a little way behind the 2:30 pacer and I reminded Sara of the golden rule – “don’t go off too fast!” The gun was fired and, 5 minutes later, we eventually crossed the start line. People were passing us left right and centre, but we were sticking to the plan of 11.30 to 12.30 minute miles. 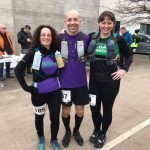 The first 5 miles were nice and steady along relatively flat, pretty country roads and in to the outskirts of Lincoln city centre where crowds of supporters were already present in abundance. Reaching the centre itself, along the small streets of boutique shops, we arrived at Lincoln Cathedral at 5.5 miles. Cue a game of “my cathedral is better than your cathedral”, to which I did somewhat relent as we ran through the beautiful expanse of gardens and stone arches. One thing we did agree on however – cobbles are a pain to run on! From here we ran downhill (similar length and gradient to Potter’s Bank) to the riverside, passing diners enjoying an al fresco Sunday brunch, and again a healthy amount of supporters. Over to the other side of the bridge and around the university campus, which was probably the least inspiring section of the course but gave us opportunity to have a few gummy bears and a bit banter with our fellow runners. Back over the river at the 7.5 mile point, ready for the return leg to the showground, and it dawns that we now have to run back up that hill, except this time it is longer due to the route. One mile, 200 feet of elevation, and one acapella rendition of “Hakuna Matata” later and we were at the top of Yarborough Road, probably with many folks thinking I’m a bit mad. Steady going for the next mile to recover then started increasing the pace steadily. 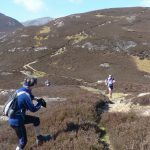 At this point Sara was beginning to struggle – we were well in to distance PB territory for her, the long hill had taken its toll on her legs and the proverbial wall was hit. This is why I was here though, and I’d be damned if we were going to drop off target after the hard work was done. This is when I drew on everything that I’d experienced from Striders. We ran for almost half a mile holding hands, distracted with talk of wedding planning and summer holidays. When that wasn’t working we did relaxation and breathing control techniques. 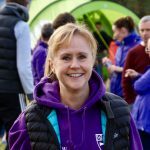 We were passing runners ahead of us at an incredible rate – probably around 30 people from mile 11 onwards, and used this to reinforce just how excellent Sara was doing, and how sticking to the pacing plan was paying dividends. Mile 12 assurances of “not far now”, and “it’s just around the corner” were stretching the truth a little, but got us over the field and in to the showground again. 200 metres to go and a burst of expletive ridden declarations of how we’ve got this and gearing up for a final push. 100 metres and the crowds cheering us in. 50 metres and I’m practically screaming “come on it’s there” before grabbing her hand and dragging Sara level with me to run in the final section and cross the line together. There were hugs all round, and maybe a tear or two fell. Goal achieved; Sara completing her first half marathon. And I experienced running an event from a completely different viewpoint. This was not about my time or my achievement. I was there to support someone else, to get them through the race, to help them reach their goal. Comparing this to my previous half marathon I didn’t feel the pre-race doubts, the aching legs at mile 10, or the post-race come down. Maybe it was sticking to the pacing plan, or better in-race hydration and fuelling. Or maybe, for me, this is what running is all about?